Ritch Froehlich is owner of Ace Wire Spring & Form Co., Inc., Mckees Rocks, PA; www.acewirespring.com. The custom-spring designer’s first consideration is the environment in which a spring will be required to perform—temperature, for example. For instance, if the spring will experience heat in excess of 650 F, it will require a high-temperature metal alloy such as Inconel. Or, if the spring will work in lower-temperature environment, perhaps a less costly material will suffice, such as oil-tempered spring wire. Some factors to consider when sizing a spring: direction of wind, particularly when engineering a torsion spring (shown here), and assembly requirements. Wind direction dictates how energy is directed through the spring—right-hand (clockwise) or left-hand (counterclockwise). Keeping with the theme of environment and material selection, the designer must establish early in the design process if the spring will come into contact with any form of moisture or chemicals, such as chlorine or bleach, or if will operate outdoors and be exposed to salt water. In this environment, professional spring designers likely would opt for Type 316 stainless steel. Though there are other costlier materials on the market, 316 stainless often is used in these applications. And, for springs subjected only to a high-moisture source (such as tap water), Type 302 stainless steel may suffice. The next requirement in material selection to address is cycle life—the number of times the spring will cycle during its lifetime. For instance, if designers are engineering a spring that works in an engine and the spring will cycle several million times over its life, they might opt to engineer the spring using valve-spring-quality chrome-silicon or chrome-vanadium. Or, if the application calls for minimum cycle life, say a safety switch that may only cycle 1000 time or so during its life, music wire may suffice. The next question: Where will the spring be installed/will it be working over a pin or a mandrel, for example? And, will the spring work inside of a cylinder or bore? If so, designers must include a safety margin in the design that accounts for these limitations. And, they must consider that springs are not machined products—they are coiled, and, therefore, the tolerances that a springmaker requires are much more substantial than those of machinists. For example, a machinist may be asked to hold a 1-in. block to a tolerance of ±0.0001 in., while a springmaker would hold a 1-in.-dia. spring to a tolerance of ±0.030 in. Therefore, when designing a spring that fits into a 1-in.dia. 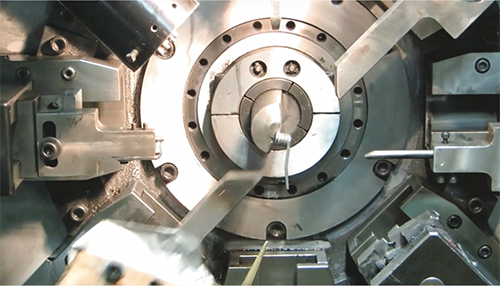 bore, the designer would be requested to build-in a safety factor of ±0.030 in., or an OD of 0.970 in. ±0.030 in. To calculate the total amount of deflection within a compression spring (shown here), the designer considers three parameters: wire size, relaxed free length and solid height (wire size times the total number of coils in the spring). Then, to calculate total spring travel, subtract solid height from the relaxed free length of the spring. To optimize spring performance, follow the 20/80 rule: Install the spring at no less than 20 percent of its total deflection, and at no more than 80 percent of its total deflection. To calculate the total amount of deflection within a compression spring, the designer considers three parameters: wire size, relaxed free length and solid height (wire size times the total number of coils in the spring). Then, to calculate total spring travel, subtract solid height from the relaxed free length of the spring. Total travel = 3 in. – 1 in. = 2 in. With total travel calculated, the 20-80 rule now is applied to establish limits for installed height. Multiply total travel (2 in.) by 20 percent—0.400 in. Subtract that from the relaxed free length 3 in. )—2.6 in. Next, add 0.400 in. to the solid height of the spring (1 in. )—1.4 in. Therefore, for the spring to work within its optimum range, the load heights required should be applied within the installed height range of 2.60 and 1.40 in. The 20/80 rule ensures that there is ample amount of travel to engage the inactive coils initially within the design, and that the spring will not engage too closely to its solid height at its final deflection. Exceeding these parameters could potentially cause failures. Other key factors to consider when sizing a spring: direction of wind, particularly when engineering a torsion spring, and assembly requirements. Wind direction dictates how energy is directed through the spring—right-hand (clockwise) or left-hand (counterclockwise). The designer also should understand how the springs will be assembled to their mating parts. 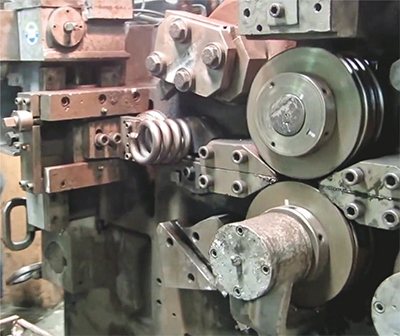 When designing torsion and extensions springs, for example, an enormous assortment of end configurations can be shaped, using CNC technology, to precisely aid in the assembly process. By recognizing the spring’s complete installation requirements, the springmaker can ensure accurate assembly for crucial form and function. See also: Ace Wire Spring & Form Co., Inc.